The world’s most famous Beatles Tribute band LIVE IN CONCERT at the Alhambra Theatre, Bradford next week! Since their inception in 1980 the band have performed hundreds of gigs across the globe, earning themselves an amazing reputation along the way. 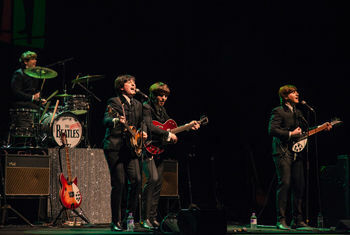 The late George Martin himself described the Bootleg Beatles experience as “A terrific show”, whilst the Mail On Sunday hailed their “Mind-boggling accuracy”. Formed from the original cast of London’s West End hit show Beatlemania, The Bootleg Beatles have become 'an institution' in their own right with their note-perfect recreation of hits from every era of the world’s most famous songbook. Every tiny detail is meticulously covered from costumes to authentic period instruments; from the ‘Liverpudlian’ banter to their ‘inflection perfect’ vocal mimicry. But it’s not only their sound that is so authentic; they bear an uncanny resemblance to the Fab Four. As one reviewer recently said... “It’s not John Paul George and Ringo ... but you simply won’t believe it”. This year the band performed a run of special ‘Sgt. Pepper’ 50th anniversary shows – including one at the Royal Albert Hall with the Royal Liverpool Philharmonic Orchestra - which have been raved about by the critics. The Times gave them a 5 Star review, adding, “Even The Beatles would have struggled to recreate Sgt Pepper this well in live performance”. The Bootleg Beatles also performed twice at this year’s Glastonbury Festival, including a Sgt Pepper show on the iconic Pyramid Stage!